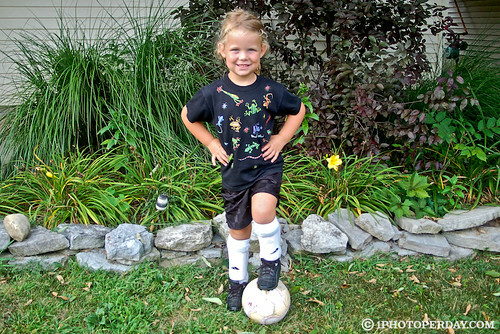 After four years of being dragged to her big sisters’ soccer games, it’s finally her turn. Nina had her first soccer practice tonight, and she had giddy seeping out her pores. She wore a mile-wide grin on her face the whole ride to practice and loved every minute of every drill and mini-scrimmage. I can’t believe my baby is so grown up already. I have this bittersweet feeling that we’re leaving a season of life behind for good. But while I might cringe at the thought of time flying by entirely too quickly, I absolutely love our girlies and the young women they’re becoming. Here’s to soaking up every minute of them! How about you? Any changes on the horizon that have you feeling a little verklempt? Oh my soul, she is the cutest little thing!!! Change is my middle name right now. Kind of. I had a baby a week ago and my oldest is starting kindergarten on Monday and my second will start pre-k after Labor Day. I only choked up once when registering my son for kinder! It’s so refreshing to see all you mamas a little sad about having your children move to new stages…our world is pushing too far in forcing children to not have time to be children. In our house we’re in the stage of teen and tween. Like Kay, it’s so surreal to believe we’re here-at this stage in life. Only yesterday I ws wondering how in the world we would ever get out of diapers! My oldest son (16)is a Jr. in HS this year-whoa! Hard to think that soon he won’t be under my authority-I am relying on God to be faithful with my children and keep them in His care. I also have daughter(s) that are 13 and 11 and a son that is 9. For a good cry read Kay Arthur’s book “Let me Home you Longer”-then cherish every moment with these precious little ones. JUST yesterday I thought to myself that I wanted Mia to grow a little faster so she’d be more fun to play with. I don’t plan on EVER having a thought like that again. Nina looks so adorable in her uniform! There’s nothing as cute as little girls in sports uniforms. We took our son back to school for his second year of college yesterday. It wasn’t any easier this time; in fact, it was a little more difficult because there is the very real possibility that he won’t even be home for the summers any more. We can’t believe we’re here – at this stage in life. It seems like only yesterday that he was running around the bases in little league. But we are trying to embrace the changes too. It’s just that these are a lot harder! The baby turned one and my son can now appropriately use the phrase, “Ah, man!” I want a rewind button! I have a feeling that bringing a new baby into the world is going to make my current baby (17 months) feel like such a little man :(. Nina looks so cute in her uniform-she’s a natural! And I bet you’re an awesome soccer mom (I’m not!). I’m feeling pretty weepy about having a middle-schooler. I have so much confidence in her, but I know it could be a hard few years. It was for me anyway. It was always my prayer to be gone from this town before she went to middle school, so I’ve been in a funk about that. I trust we’re here for a reason, I just haven’t figured it out yet.